We don’t know about you, but time seems to just disappear around this time of year. Holiday planning, decorating, shopping, baking eating, and before you know it, it’s halfway through December! Gift cards for massage make a great gift that doesn’t take much effort—we’ll do all the work! You can buy gift cards online and have us ship them to you, pick them up in our store, or just leave them at the front desk for the lucky recipient. You can also just choose to load any amount you’d like on a card. We’re flexible like that. Everybody knows about our famous Swedish massage, but just to show you we have something for everyone on your holiday shopping list, check out a few of our other offerings. Back rubs at home are a certain kind of great because you’re with your significant other, but every once in awhile it’s nice to let a professional have a turn. Couples massage is the best of both worlds! The lasting effects of massage will make you glad you skipped one night at the movie theatre. Take a break from the chilly weather. Bathe your muscles in relaxing warmth during a hot stone therapy session with us. Professional massage therapists will place smooth, water-heated stones on distinct areas of your body to promote deep relaxation. Hot stone therapy is a great option for people who prefer a lighter massage. It also enhances circulation, which helps people get blood flowing to their cold feet! Spend any time skiing or snowboarding yet this winter? Let us rub those bumps, bruises and sore muscles into sweet oblivion. Our professional massage therapists can target your muscle-tendon junctions in your body. Whether you’re an athlete or just somebody who feels the pain of an active lifestyle we can help prevent sports injuries and also help you recover. Massage gift cards are a safe bet for quick holiday gifts that you know your friends and family will enjoy. 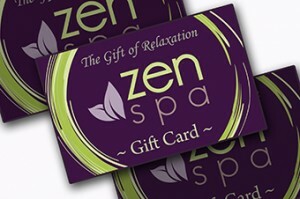 Feel free to buy some gift cards on our website, give us a call or drop by the spa while you’re out and about.